Eyelid inflammation, also called blepharitis, is a common and sometimes chronic condition where the eyelids become inflamed and swollen often with oily particles and bacteria coating the eyelid margin near the base of the eyelashes. This is an annoying condition that causes irritation, itchiness, redness, and stinging or burning of the eyes. While the underlying causes of blepharitis aren't completely understood, it can be associated with a bacterial eye infection, symptoms of dry eyes, or certain types of skin conditions like acne rosacea. 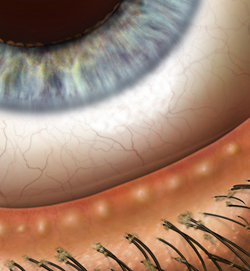 Blepharitis is often a chronic, or ongoing, condition, but it can be controlled with one of more types of treatment that may include warm compresses, eyelid scrubs, antibiotic ointment, nutritional therapy, and good overall eyelid, scalp and hair hygiene. If you or someone you know experiences eyelid inflammation or is bothered by the symptoms of blepharitis or inflamed eyelids and needs help, please call Baltimore Washington Eye Center at 800-495-3937 to schedule an appointment.